Stratasys has introduced a new polyetherketoneketone (PEKK) thermoplastic material for its fused deposition modeling (FDM) process. Antero 800NA reportedly offers significant advantages for many manufacturers, including lighter-weight parts and reduced inventories. Antero 800NA is said to outperform other high-performance thermoplastics with its superior chemical resistance and ultra-low outgassing. In addition, the material possesses high temperature resistance and exceptional wear properties. 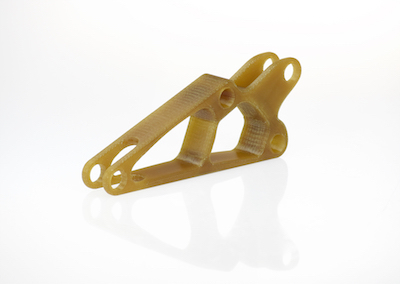 Aerospace and other high-performance vehicle makers wishing to move to an additive manufacturing process will be among the most interested in Antero 800NA according to Stratasys. Its superior chemical resistance means it can be used for components exposed to hydrocarbons, such as fuels and lubricants, as well as many acids. Additionally, its low outgassing allows it to be used in confined spaces and sensitive environments, such as satellites, where outgassing even under vacuum is prohibited. Further, Antero 800NA’s high operating temperature is designed to allow it to be used for applications under the hood or in engine compartments. Custom or low-volume additive manufacturing with Antero 800NA has economic advantages over traditional machining processes. With traditional processes, manufacturers buy bulk PEKK (available only in limited shapes and sizes) and machine it to a net shape, which wastes a considerable amount of expensive material and has a longer lead time. With an additive process, the workflow is faster, yielding lighter-weight parts with optimized topology and significantly reduced waist. Unlike PEKK parts made with some powder-based additive processes, Antero 800NA parts created with the FDM process are said to be more durable and dimensionally stable, even when building large parts. 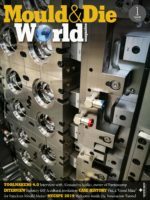 This includes better elongation in the X and Z axis, resulting in tougher parts; consistent mechanical properties; low-volume cost advantages; large-part dimensional stability; and FDM technology advantages, including ease-of-use and design freedom. Antero 800NA is the first commercial product in a planned new family of PEKK-based materials. The material will be offered with an initial layer thickness of 0.010 in (0.25 mm); additional layer-thickness options are planned for future release. Existing Fortus 450mc users with the high-performance material bundle will be able to use Antero 800NA without additional license fees. Fortus 450mc users without the high-performance materials bundle can purchase the high-performance material bundle or an individual material license. Fortus 450mc systems will require the Nylon 12CF hardware upgrade along with a new tip and purge ledge to operate the Antero 800NA material.